A brand new gearbox shift tower, complete with new forks, shafts and a new chrome gear lever. Ready to install. Note: This is the style that had the handbrake lever to the right of the gear stick. 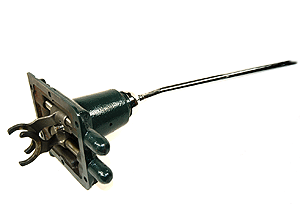 (If you have the early type, with the handbrake lever in front of the gear stick, you will need to purchase the later handbrake lever and mounting bolt set).